I’ve ready many books about Lent, Easter and Passion Week in my long Christian tenure. I’ve read it from Evangelical perspectives, from within the Catholic and Episcopal traditions and read Methodist resources, too. I could speak about a stack of books. I could, but there is one that surpasses them all in my opinion. 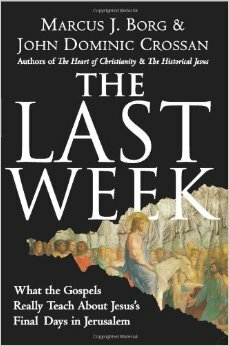 When I read The Last Week I finally understood the arrangement and narrative arc of Holy Week. I learned more about the political and socio-economic realities that underpin this pivotal week in the life of Jesus. I understood the flow of the days and how certain parables and conversations were part of this significant week – not disjointed verses only shared out of context the rest of the year. I grasped something about the Cross I’d never considered before, something about how the life Jesus lived brought him to this kind of death. I also saw the connection with the kind of life I ought to be living. The scholarship of Borg and Crossan is top notch. Their writing is accessible and moves like a good story should. And even if you don’t agree with all their conclusions – you will still walk through The Last Week with a deeper understanding and arrive at Easter Sunday with more reason rejoice. This Holy Week I am reading a chapter per day, as each chapter centers on one day of Passion Week as narrated in the Gospel of Mark. So this week I will encounter the cleansing of the Temple, the fig tree (cursed and then withered), talk of taxes and silver coins, the woman who anointed Jesus’ feet, the parable of the greedy vineyard workers and the widow who gave her little bit… and begin to see how they all contribute to the final things Jesus wanted to say. There will be reflections on Judas, the betrayer, and Peter who found himself dismayed that he denied Jesus, and the women who never left. And yes, The Last Supper, the long walk to Golgotha and death as an insurrectionist and the harrowing of Hades on Saturday (since I am an Apostle’s Creed kind of woman). I will rejoice when Sunday comes – and I stand alongside Mary, the first witness of the resurrected Jesus! Reading The Last Week is a great way to walk toward Jerusalem with Jesus and continue to witness to the truth of His life, death and resurrection. Okay… one more came to mind! Chapter 33 for Easter Sunday. 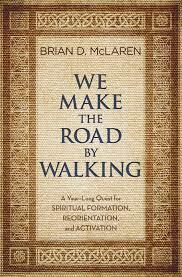 I’ll add – this is a great resource for Holy Week, Advent and all year long! This sounds like exactly what I’ve been looking for. We serve such an orderly, intentional God. Surely, surely, every last one of His actions on earth carried great significance. Buying it (of course). That Borg/Crossan book looks amazing – just added it to my Goodreads to-read list!